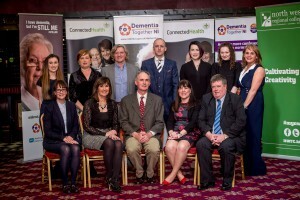 Health and social care staff from all care sectors celebrated their graduation, on 1 February 2017, in the first Dementia Champions training to take place in Northern Ireland. Congratulating the graduates, Lorna Conn, Dementia Together NI Project Manager, HSCB, said: “This is a very special day. This graduation ceremony represents the culmination of the hard work and dedication of our graduates, their managers and our training providers Connected Health and the North West Regional College. Geraldine Lavery, Head of Health at North West Regional College (NWRC), highlighted how those who took part in the Dementia Champions programme have developed not only improved dementia practice skills but also e-Learning skills which they can now apply professionally and as lifelong learners. 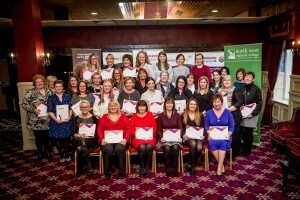 She added: “NWRC is delighted to work in partnership with Connected Health to deliver this innovative blended learning programme which consisted of participants taking part in one day of workshops every six weeks alongside online mentoring. Key areas covered by the programme include receiving a dementia diagnosis, research and evidence based practice in dementia care, communication and promoting enabling environments. The course is delivered via a blended learning approach of five study days, online resources and the submission of work-based assignments. Open to health and social care staff from all disciplines and work settings, it is unique in that students are required to undertake a change project within their area of work that will lead to improved practice, care, support and treatment for people with a dementia and their carers. The Dementia Champions Programme focuses on the standards set out within the regional Dementia Learning and Development Framework launched in September 2016. This framework outlines the importance of a well-trained health and social care workforce in providing care for people living with a dementia. The Dementia Champions training demonstrates the action being taken to build on good practice and develop dementia care which meets current and future service need. 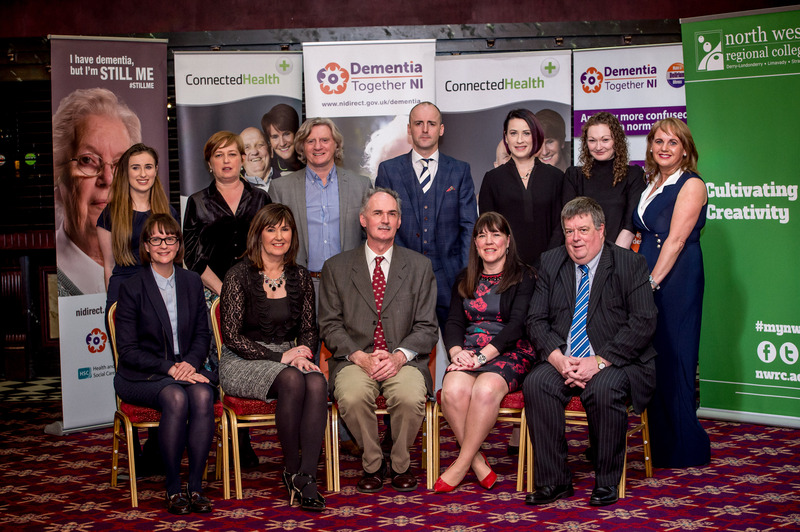 During 2017 a further two cohorts will complete the Dementia Champions training programme which will bring the number of Dementia Champions in Northern Ireland to over 300. Commendations also went out to representatives and staff from Dementia NI, staff from across the voluntary, statutory and independent sectors, and, academics and regulators for their contribution, through their commitment to the Dementia Champions training to the development of a competent and skilled workforce for the 21st Century. It is estimated that there are currently 20,000 people living with a dementia in Northern Ireland of whom approximately13,000 have a confirmed diagnosis. It is thought that as many as 1,000 people living with a dementia are under the age of 65 years (DHSSPS, 2011; Alzheimer’s Society 2015). Projections suggest that 23,000 people will be living with a dementia by 2017 and this number is expected to rise to 60,000 by 2051. The strategy, Improving Dementia Services in Northern Ireland – A Regional Strategy (2011), is available on the Department of Health website. A key action from the strategy is to co-ordinate a training and development plan across primary, community and secondary care, in statutory and non-statutory sectors, to improve knowledge and skills in providing care to people with dementia.